Bob Nurin of Lamy USA said at the Miami show that he might be seeing them in August but didn't have a firm date. 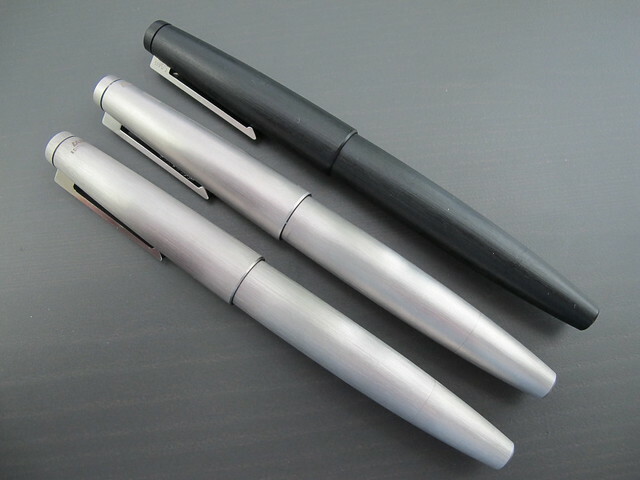 I was able to confirm that this morning with my Lamy rep as well; they are optimistic for mid-August here in the US. The pen is BOTH full AND empty! If it was like an Aurora with the Riserva Magica, it would be more acceptable to not have an ink view window because I would have warning before the pen ran out of ink, but if this shares the same piston mechanism as the original 2000, that would be a bit of a problem. I would have to take a backup with me all the time. Personally though, I would like to see how this pen is constructed. I would imagine that it shares a good number of parts with the original 2000. I have a "usual" 2000 and, while I love it, I wouldn't go for another. I just do not like the tapering section. I feel my fingers are always slipping down. Selling: Oversize Sheaffer Balance Pencil (ca. 1934). Here's a quick photo comparison. I'm catching up on work due to family illness. When I am up to speed, look for a full comparison review. "2012 edition" refers to the new version; 2000 Edition refers to the millennium edition released in 2000. - 2012 edition is *very* similar to the 2000 Edition. 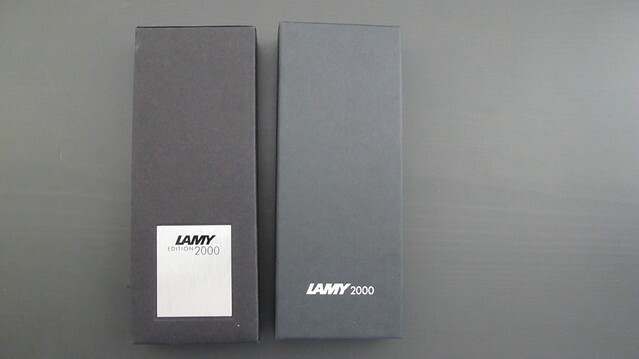 If you want a stainless steel Lamy 2000 but don't want to pay the going rate for the 2000 Edition, this is your pen. 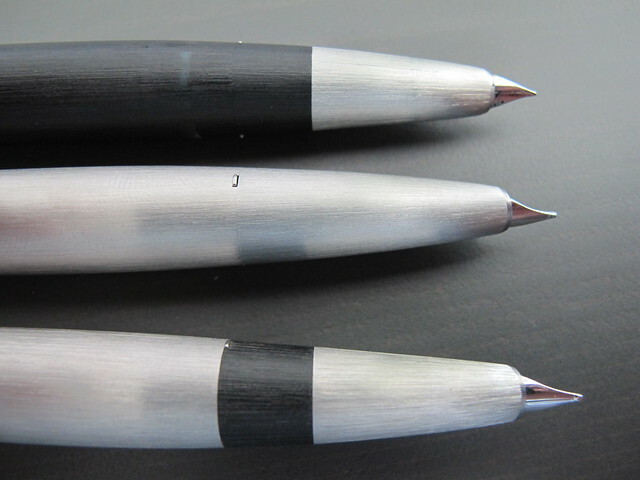 -2012 edition has the "ears" recessed into the pen body. The standard issue and 2000 Edition have the ears recessed into the section. See last photo. -Slight differences in section construction, but otherwise the construction feels about the same. -Capping feels a bit rough on the 2012 edition vs. standard edition and 2000 Edition. -The finish is a bit more polished on the 2012 edition. The 2000 Edition more closely resembles the finish of the standard Makrolon finish, in my opinion. Boxes. 2000 Edition on left, 2012 edition on right. Hey, a quick question for you: does the 2000 Edition have an ink window in the black bit? It doesn't appear to. No. You can barely see it, but in the top pen, the ink window is on the body end of the pen, "under" the ears. 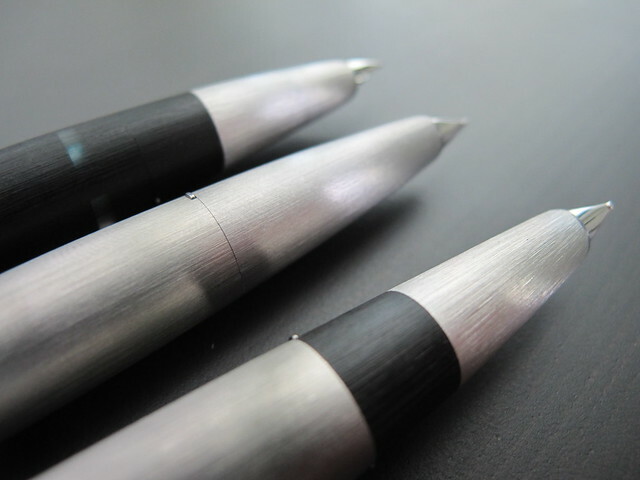 The regular 2000 and 2000 Edition use the same section (the black Makrolon and stainless steel part near the nib). Edited by bphollin, 31 July 2012 - 01:07. Wow, the windowless one is beautiful. It must be even more glorious IRL. Would I get one if I had $300? Even if there's no window? I'm clutching onto my "normal" 2K for dear life. It's one heck of a pen. Edited by Ytland, 02 August 2012 - 14:21. How do you know it's overinflated? I would love for someone to show me numbers in relation to the manufacturing costs between the Makrolon 2000 and this new one to justify these types of statements. 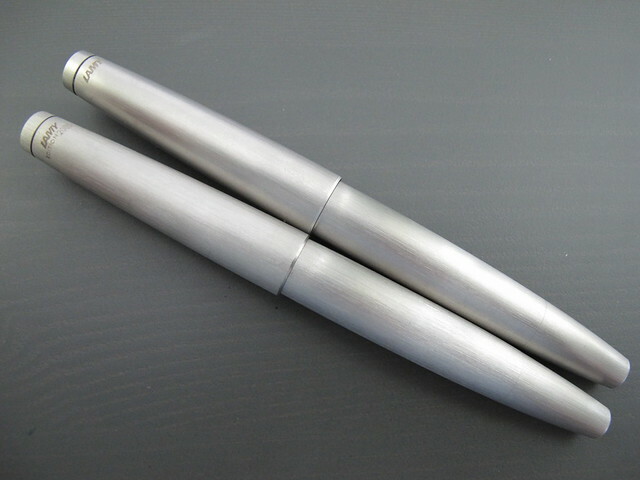 For all we really know, Lamy's profit per pen could be greater on the Makrolon 2000. I'm guessing their manufacturing process has become pretty efficient (read cost saving) since they've only been producing the pen for 50 some odd years. One could argue the new SS version is a better example of a Bauhaus design in its consistency, unity, continuity, and monochomaticity. While the SS isn't as subtle as the Makrolon, it's brushed finish is definitely less offensive than that shiny platinum coating. Nope, I'll get one but I'll wait. I love mine, but no rush to get another and I'll likely get the XF, I have a fine and it writes pretty wide, so I'll get the XF, but try it first at one of the few B&M stores I go to as I know they can be scratchy and hit or miss as to the quality of the nib. I think what they mean by "overinflated price" is that the pen is just too expensive. For example, I can buy a new 2012, durable, light weight Thermos stainless steel water bottle of top/equal workmanship for only 15 dollar from a large outdoor chain that don't give discounts at all. And you are trying to sell me a pen for 20 times the price which is already discounted? And, by "and the complete reversal of the proprietary minimalist and inconspicuous design ethic"
They are really saying "Lamy is no longer one of us"
But then.... with the stock market going up and down 300 points every week, there will be millions of people that's making lots of money out of thin air every day.... I always say, no matter how much you make, as long as other people are making more, you will be losing. Edited by tempo, 02 August 2012 - 19:43. What used to be 8000 is now 15000 and there is a 8 month line up to buy one. So, yes, pens will continue to go up unless 1) we have another economy crisis, 2) pens go out of fashion. 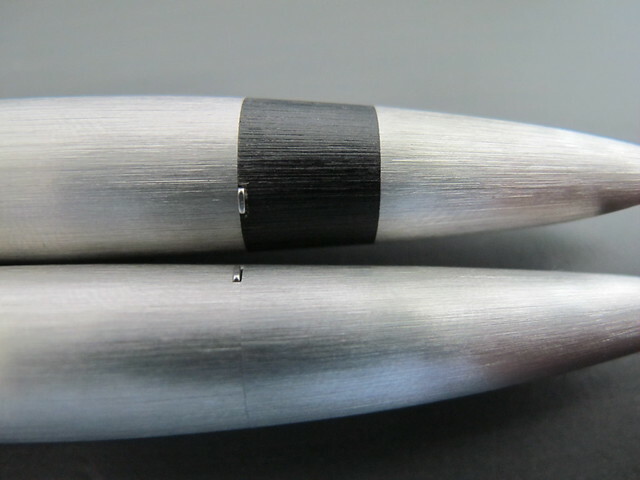 Your Thermos water bottle is extruded, which is a bit cheaper than machining a Lamy 2000M out of stainless steel. Stainless steel is a bit more difficult to machine. 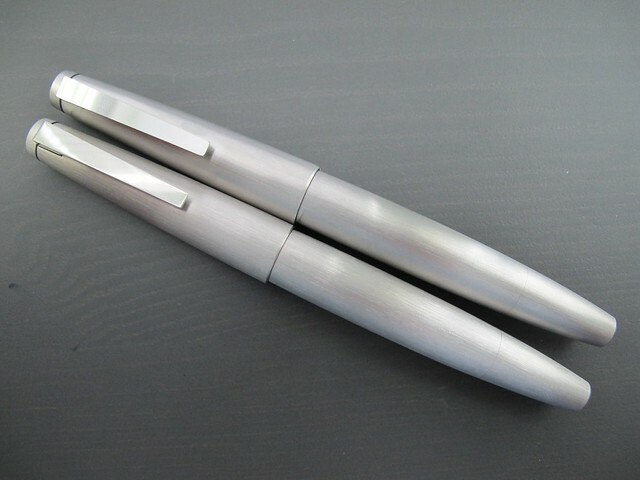 $300 is about as much as I would expect a product such as the Lamy 2000M machined and finished from stainless steel to cost. Won't get one...just too expensive. I like the original version just fine! Hi all, just got back from pen shop. Listed as 398 Canadian dollar. with sale tax extra of course . I'll wait by the classifieds. Maybe I can get one, take it apart, and shoot a lot of macro pictures comparing it internally to the old version and go from there. You have a point, but if you think $300 is about right for the 2000M, then how does Lamy pull off the stainless steel Studio for $60? There's not $240 worth of difference where material and machining are concerned. Edited by fourseamer, 02 August 2012 - 23:14.